The top knot roof is finished! Whew! 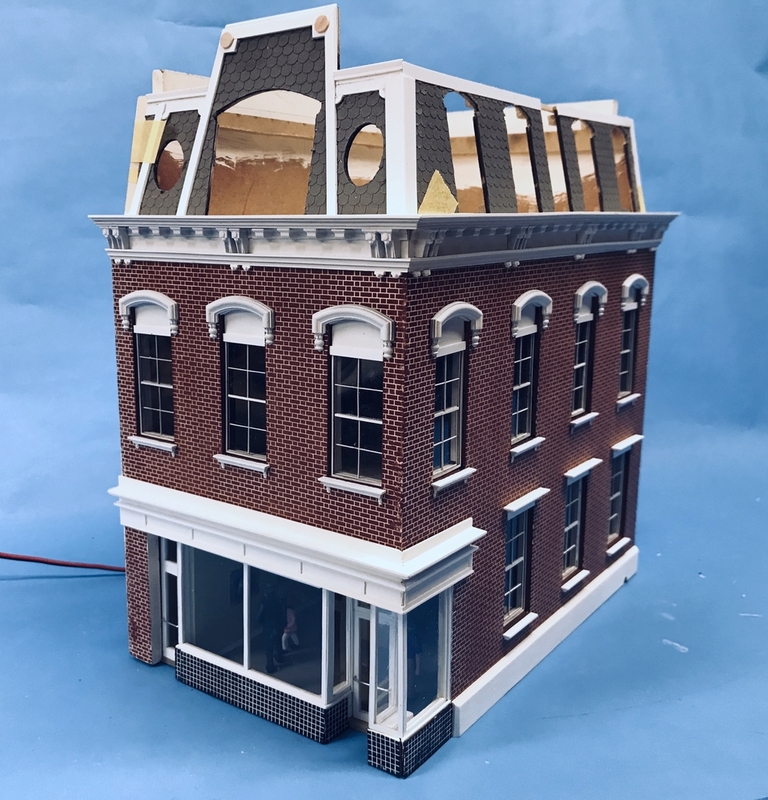 It was the most challenging part of this build (so far), but it is now complete and ready to be installed once I paint it and add the roofing paper. I got the gable windows are finished and installed. I even made two of them in the open position. And lastly, I finished the "tile" facing pieces for the store window sills. I remade the entire top knot base taking actual measurements off the Mansard front AND the Top Knot Roof base so all would engage properly. 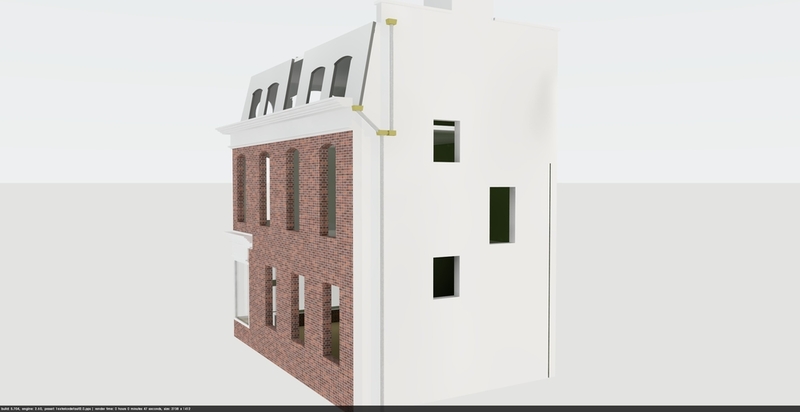 For some reason my Mansard roof side taper was not equal from side to side. I traced the taper as it was account for any field variations. I glued this up out of 0.040" styrene with 1/4" sq. styrene corner reinforcements to keep it nice and square. I also added a front piece that would sit flush behind the Mansard so the styrene formed a complete box. On top of this frame I glued an "almost" square piece of styrene sheet to further reinforce the geometry and to provide a broader gluing base for the top knot roof itself. The balsa/styrene composite top knot was glued to the based with thick CA. At the seam between the two main parts I glued a 1/2 round trim piece which was held with solvent cement since it was basically glued to the edge of the square transition piece. The laser cut wood rafters for this roof were not the correct length, so I made new ones out of styrene. These were glued to the upper roof ply with thick CA. The Top Knot roof consists of four right triangles. They not since the roof has a bit of pitch which reduces the included angle by a few degrees. I started with a right triangle and then reduced the angle so the roof pieces would split the corner rafters down the middle so they would be glued on both sides. I made the roof piece of out 0.015". The first piece fit so well that I thought I could just trace it as a template for the other three. The 2nd one wasn't right, so I scrapped it and hand-measured the next one. I then traced that one thinking that it would be better, but I had to do the 3rd and 4th individually. The 4th one was particularly tricky since the final exposed rafter wasn't very wide and needed the roof to be dead on to contact both sides enough to glue it. But… it did get done. Around the upper roof perimeter I glued 0.080" X 0.030" to trim the edge and seal the roof edge. On this will go a "rubber membrane" roof which will happen after it's all painted. When the trim is all added to the Mansard it's going to look very special. I did spray it with a light coat of Tamiya Fine White Primer. I may add another coat or just go with the white. Windows in the below and not installed yet. (neither are the Mansards which accounts for the masking tape). The last thing I did was prepare the laser-etched front sill tile laminate. I first brush painted with 2 coats of the Tamiya gloss black. When dry I sprayed it with rattle-can Testor's high gloss coat lacquer (sold for model car finishes). When that was dry I did my joint compound trick. When dry wiped it with a damp paper towel. The end result is okay. It's a bit irregular and I may add some more grouting tomorrow. I'll see. The ragged one (top right) was hand made since I miscounted the number needed and had to make one more by scribing my own. It's going on the inside of the right sill next to the front door and not really visible. Little by little, all the bits and pieces are coming together. I'm writing the article about this project concurrently with the build so I won't have to re-create the steps in my memory. Today was a hodge podge of activity. I spent time doing foundation painting and starting to mount, or at least figure out how to mount, the store windows. I opened up the scuppers to accept the water collectors from the roof, got the sill tile in place and, finally, decided to build another front window since the condition of the first one was fair to poor and getting worse each time I touched it. I used the Pritt glue to hold the tiles to the sills and then enhanced with a dribble of thin CA. The front piece was 1.5 tiles too short, and the side sill tiles were about 8 tiles too long. Perfect! I was able to use a piece sliced off too extend the wall. I glued a piece of 0.040" square stock just on the front edges of the lower window sills will perfectly framed in the windows. I did an experiment of just gluing the right side windows to the building proper, to see if I could insert the entire base without wrecking anything. It worked, but I have to slip the ceiling in first to clear the window and then push the diorama straight up. I used a 1/16" carbide router to hack open some scuppers that will drain imaginary rain water from the roof in two places. I'm going to try and replicate the intricate 3-way rain downspouts. There are two assemblies: one the back left corner and the side right corner. They're not visible from the decorative front of the building. The collection boxes will be soldered brass. The tile front really adds interest to this building… in fact, there's interest in many places. When you look at this gem on Google Earth you realize that it's the only building of its type and era that exists anywhere around it. It's really good that it's been preserved. The added the trim pieces to the main window sill and tried the window in its place. It was then that I decided the front window was crap and I had to remake it. Again… benefits of scratch-building… you can do stuff over. 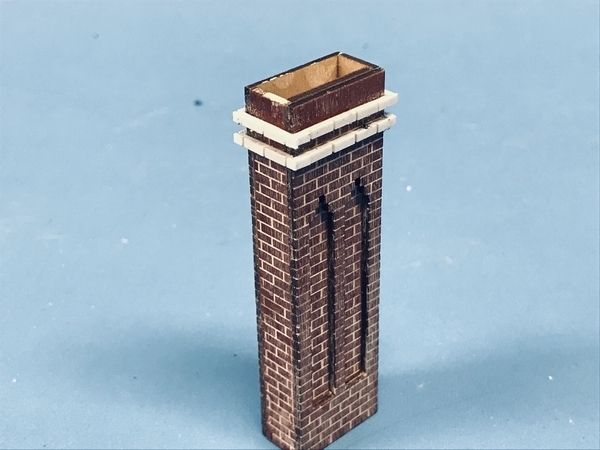 This time, I worked specifically hard to prevent glue from getting on the styrene, and instead of using thin cement to hold the glazing to the windows, I used carefully applied Testor's tube cement before applying the strips and very carefully placing it on the glazing. It worked! The window is much cleaner and I'm still going to coat with Pledge to even it brighten it. Here's the new one. Practice makes perfect! If I keep building these windows I might actually get good at it. One of the weak spots is the right angle junction of the small side window to the main one. I went from using 0.010" sheet as the building matrix to using heavier 0.015" sheet. This will help a bit, plus I'm going to exert more care in matching the side window frame into the corner of the main window so it has better gluing surface. It's funny… in the early 70s, while being a shop teacher, I actually researched being an architectural model maker. 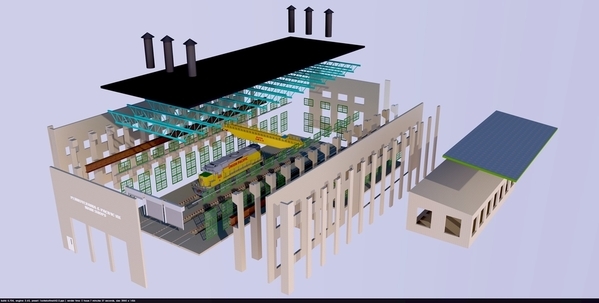 It was 20 years before computer aided design was widely used and 30 or more years before laser cutting and 3D printing could be used to quickly and accurately create architectural models. 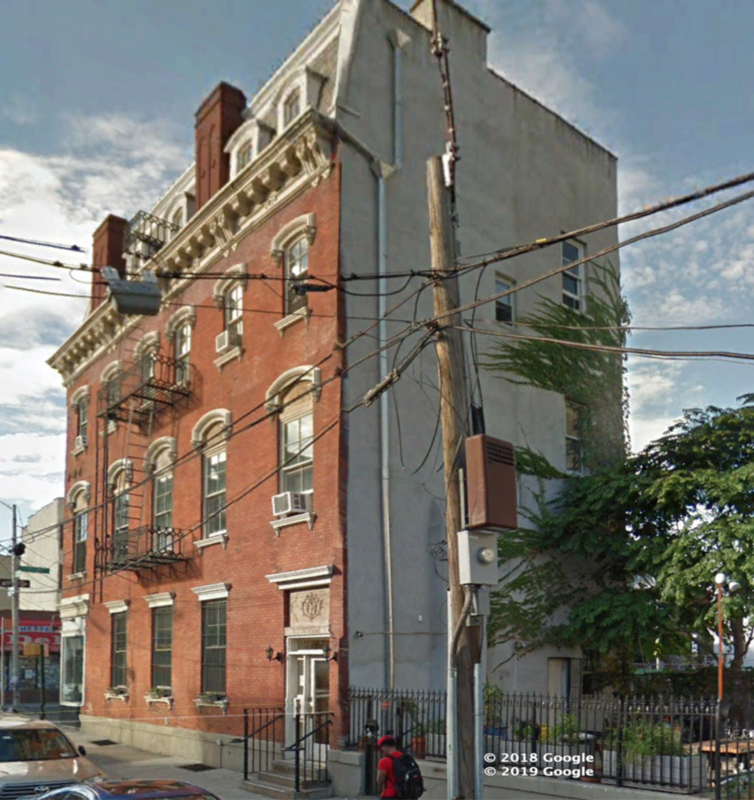 There were several big studios in Philly where I visited and spent time with the proprietors. It was very interesting, but a small, exclusive field and was already feeling stresses of the costs that a fine model was costing. So, of course, I didn't do it. But then here I am almost 50 years later building models of buildings using modern and old-school methods. Glad to hear you were able to exercise with no issue. I’m following this project with fascination, wonder, and a lot of head shaking (as in how’d he do that)? Thank you for taking us through the process. Thanks for the good wishes. My pulse got up to 144 yesterday which is too high so I'm going to back it down a bit next time. Regarding "How did he do that?" I would hope my extensive descriptions would answer that question for you. If not, I need to do a better job. Due to spending time at my daugher's waiting for a new washer to be installed, and taking #2 grandson to piano lesson, I had a shortened session today. Finished gluing up the new front window. Besides changing gluing methods and being more precise, I slightly changed the method of framing the side window to give it more strength and more gluing surface area. I added framing on all four sides including the one mating in the corner with the front window. This adds some thickness to the forward edge of the side window, but greatly increased the rigidity of the corner joint. Here are the front and side windows clamped to an angle plate so it dried at a perfect 90 degrees. I glued the sub-roof in place using Aleen's and while this was drying with some weight on it, I went to work preparing the oval windows with glazing. At first I thought the internal step in the oval was too close to the edge to preclude using a shape instrument to trace the oval's i.d. on the clear styrene, so I came up with a scheme that I thought would work. I traced the o.d. and cut it out with scissors (the styrene's thin enough that you can use scissors for curves). I then measured the wall thickness with the caliper and transferred this to the oval clear part and cut out that shape which was supposed to be the window size. It was way too small and fell right through! So I went to plan B when I found that I could trace the o.d. directly using a scribe. I then traced it and cut out this piece and after some edge sanding, it fit very well. I spent some time retouching the white paint before gluing in the windows permanently with some thick CA. After both windows were glued in I went back and did more retouch up on the white so the glazing looks like was born there. So both oval windows are complete and ready for installation in the front Mansard. I need to prepare the widow's walk laser cut pieces with the addition of some epoxied wires extending down from the bottom so there will be something positive to fasten them to the upper trim piece. After the epoxy sets I'll air brush them semi-gloss black. I need to create said upper trim package and prepare the other trim pieces for the front Mansard and rear edge of side Mansard. The sides of the lower top knot need to be shingled like the Mansard. This last bit should be fun and shouldn't take too long. I also have to build the two front doors. I may have snookered myself with the back door since my exposed brick work falls where the prototypes back door is. So I'm going to put my on the back corner of the left wall. Any ideas about how to add ivy vegetation to the big blank wall? On the ivy, I have dribbled white glue in thin crooked streams resembling branches and sprinkled green ground foam. Use the glue strait, don’t dilute. In the case of such a handsome building I think something like Scenic Express foliage would look more realistic. As to not explaining well enough, I think the problem with me is I don’t read closely enough. You provide such detailed explanation, the only addition could be another photograph to go with the explanation. This is a general comment, I have no particular procedure in mind! Thanks Mark! I did find this in Scenic Express' catalog and it might work, although it represents an investment that may be out of proportion to its importance. The 3-sheet set should give me reasonable coverage to give the correct impression. I realized when I got up this morning that I may have snookered myself by gluing the 2nd floor ceiling in place yesterday since I wanted to add the vision blocks to that floor AND I wanted to work on some exterior lighting like the prototype has. I had to put the vision blocks in with the building turned upside down. Instead of over-engineering these I simply cut them out of cardboard and pasted some black construction paper on them using PSA. To make sure it didn't interfere with the fit of the first floor diorama, I measured its height and marked that height on the side wall. Then measured the cardboard to be slightly smaller than this distance. It's glued to 2nd floor ceiling with some Aleen's. I glued a small ceiling piece over the front door area and was debating with myself if I wanted to have any lighting in that spot and decided, "NO". The ceiling is glued to the side window which is part of the building proper. Then I glued the main store window after shimming up the back edge of the inward facing window that leads up to the front door. I double checked to see if the building would go together and not interfere with either of the window assemblies. The main window was a little distressed so I relieved its height just a tad and now it fits completely flush when the floor is at its final position. All of this nonsense is because I wanted to make the insides removable. My wife suggested tonight that I probably risked wrecking the project in my attempt to make it removable, especially since I may never have to take it apart. She may be right … often is. Another complication which I thought about this morning, and especially since I'd blocked access from above by gluing in that 3rd floor was making it easy to tap into power for the outside lighting. I engineered a system that will enable me to power the outside lights which are part of the building by the power hookup that's part of the first floor. I cut the power cord shorter and added a junction block (Euro Style). I stripped and prepared the leads for ferrules. But before adding the ferrules, I stripped another set of leads that would go to the building's front, and put both sets of leads into eh same ferrules thereby giving me a nice parallel circuit for two more LEDs. These too will be driven by their own CL2N3 driver chip and being parallel will enable to me to add more LEDs without reaching the voltage limit of a single series circuit. I then connected the main power lead to the other side of the junction block and led it out of the floor. The diorama is laying on its side with the base to the right. Then, in my usual over-engineering mode, I wanted another junction nearer to the front where the outdoor lighting leads would connect. Had I thought this through, I could have eliminated the need for the first junction by simply making the front junction the only one and using that for the voltage tap. 20/20 hindsight. That's servo tape holding the junction blocks in place. So… I'll be able to slide out the diorama and then disconnect the power to the outdoor lighting, again making it so the interior will be completely removable. My last thing was to start building the front doors. As with everything else with this model, my laser-cut door pieces were too wide, so I'm scratch-building those too. As this pic was taken, I still need to cut out the white part, glaze the door and add the back framing. Thanks for the update, Myles. The first two images say "image not found" . The last three images I can see fine. Don't know what to tell you. I'm seeing all five. I reloaded the page and they were all still there. My statement “how’d he do that?” was more amazement than not following. Your explanations are straightforward and thorough. Thank you. Better over engineered than under engineered! Always a good read!! I'm having the same trouble as Pat earlier not seeing the first two photographs. Yes if it is an expensive solution for one use, it isn't worth it. You are doing an amazing job with this building. Myles it looked really cool. Keep up the good work. Did you ever finish and place the petroleum tanks? I don't think I ever got to see them placed. Thanks Guys! Adriatic… no promblemo! Happy Monday! Got the front doors built and installed today and did the Top Knot finishing. As you'll see on the finished picture. The apartment door is much, much narrower than the main gallery door. 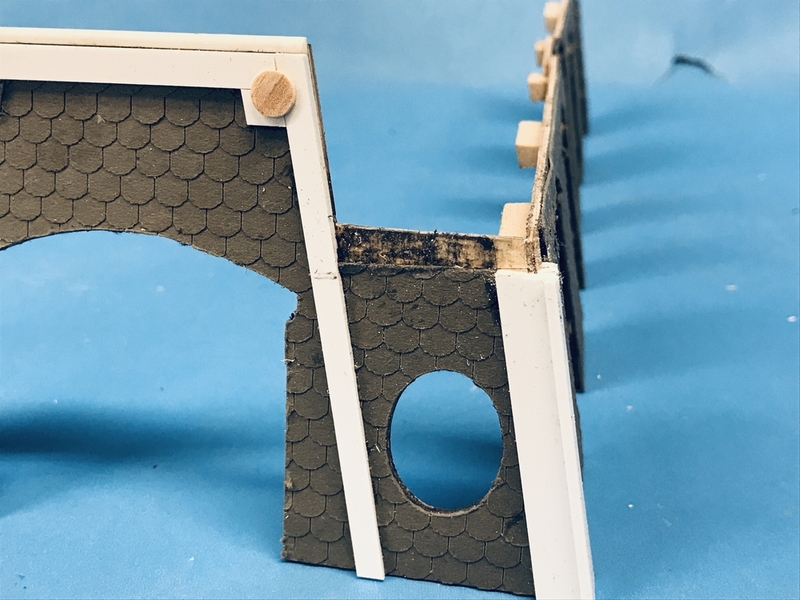 I still don't know why I reduced the width of the building when I reduced the height and length… maybe I was trying to keep the proportions, but the result was both doors were smaller than my laser cut pieces and the left-hand door was very much narrower. 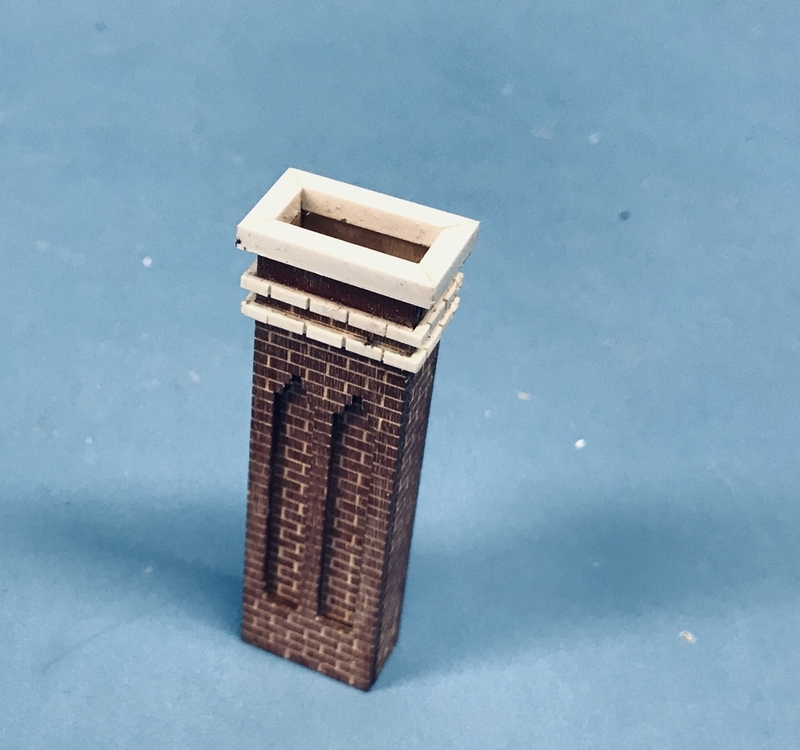 As I said before, I could have removed stock from the brick wall next to the door, but this gets some more detailing which I didn't was to short change. I installed both doors attached to the first floor plate. Both needed packing to fill the gaps between the front window assembly and provide a secure mounting surface. I used solvent cement to glue the styrene parts together and medium CA to glue the styrene to non-styrene parts. I have to be especially careful when assembling the base to the building, but everything does nestle in nicely. I built the transom and door as separate pieces for the main door and this led to some minor alignment problems. For the apartment door, I simply built it as one piece and cut a line to simulate the door separation from the transom. For the door handle I bent some 1/32" solid aluminum rod which negated the need to paint it some metallic color. Nothing simulates metal better than metal. Here're the two doors permanently installed. Circumferencely challenged individuals might have trouble with that left door's width. The front assemblies were a lot of work and fiddling. I air-brushed white on all the top knot exposed surfaces, so it was time to finish this detail. The sides of the top knot get fish scale shingles which I did today. I then used my left over, self-adhesive, sheet roofing (Bar Mills) and a scale 4' wide. I put the roofing on and went back and CA'd any areas that weren't sealing properly. I then masked the white edges and brush-painted two coats of Tamiya Nato Black (very dark gray). The second coat I brushed in the direction that water would flow. All of the edges and corners get additional fancy molding. It's going to look much more refined by the end of this week. The junction between the Mansard and the top knot also gets some of that 1/2 round trim once it's all glued together, which it isn't yet. Trim work will start tomorrow. Myles, The doors and whole store front looks great! You can sure see the visitors to the art gallery admiring the art. I never knew what to call the top knot until I saw you referring to it. It looks great! Do you know if there was a purpose for it other than decorative? I had thought the purpose of them was for ventilation, like a cupola on a barn. But your research has shown this is completely enclosed. I'm just curious. The building looks fantastic, Myles. I agree, it looks like most people would have to turn sideways to get through that door. The gallery looks amazing. Thank you! Mark, you may be on to something. In the aerial photos from Google Earth it looks like there are openings in the top knot's base, so ventilation may be its purpose. Didn't get into the shop until 3:00 today so not much to show, but I did get started on the Mansard trim. There is a sequence of vertical/angled large partitions that add shape to the Mansard, and then there's the corner trim. There is upper trim in two layers; a lower layer connecting between the verticals and then the top trim which is an assembly. I had to cut through the shingles and the construction paper which lies beneath. I then scraped the area clean to remove any PSA residue. I glued the styrene with med CA and trimmed the tops and bottom flush with the micro saw and then sanded flat. To get the corners built and not have to do it handling the entire building, I glued the side and front Mansards together and then built the corner. The only additional trim on the side is the upper cornice trim and the back corner which gets treated the same as the front left corner which is not part of the front Mansard, but the building itself. The only problem with now have a right-angled assembly to deal with is it makes it harder to cut the shingles et. al. away to prepare a good bed for the trim, but I'll work around it. Spent a couple of hours building the decorative framing on the Mansard roof. The relief of Tuesday's work wasn't sufficient so I added another layer of 0.156" X 0.030" styrene. There are also some circular accents. I also started building the top cornice detail. The circles are slices of 1/4" dowel. I tried some other diameters including cutting my own pieces from styrene sheet, but the dowels offered the most practical way to produce the ornaments. I had to cut away the roofing every place I was running the trim. It was time consuming and stressful, but I did okay. Couldn't rush it. To keep all these angles consistent and not make too big a deal out of it, I just marked some lines with a Sharpie on the Chopper so I could line up the strips and duplicate the angle. The top cornice has a concave curved inner surface which I tried (operative word… "tried") to replicate. I thought I could use some thin styrene stressed to form a curve between the trim. It didn't work. The solvent cement combined with the stress caused the thin material to collapse, and it pushed the elements out of square. Plan B: Instead of trying to make the curve, I would just produce an angled piece to represent the curve. It's viewed from 4 feet away. I also didn't add the wide, top piece since this is going to overlap the upper roof and will provide the mounting surface for the widow's walk. I shaped one edge of the angular piece so it settled in at the correct angle. It wasn't elegant, but it did work. In the below pic you can see the doubled-up trim pieces. The inner corners of the front trim also have some little filler pieces that nest into the corner angles. They are parts of a circle. I scribed the circles with my machinist dividers with the one leg sharpened to a chisel point. After setting up the angles across the diameter, I cut the little pie slices and then had to clean up the edges. These guys were little! I held them lightly in my parallel jaw, non-serrated pliers and sanded the edges to match the scribed circle line. In this case, I didn't remove the roofing. I just CA'd the parts to the shingles which put them at the same level as the other trim. I actually tried to cut the roofing, but it wasn't going to be a good thing. I was hoping to be able to NOT have to paint any of this, but there's enough variation in the surfaces to warrant painting. I also have glue on the roofing. So… I'm going to paint the roofing a gray…probably a bit lighter than the paper, and then mask and paint all the trim. I need to add flashing over the big window too. Would have liked to have avoided this additional work, but this roof is one of the building's focal points and it needs to be right. I started working the cornice trim on the long roof also. This roof doesn't get any of the other vertical details except that wide piece at the rear. This is definitely not a project for the faint-hearted. I really couldn't have attempted this one if I hadn't built the five other major scratch-builds that preceded it. A couple more weeks of effort and the building should be finished. Finished up as much of the upper cornice as I could do until gluing the Mansard onto the roof. And I also put the end trim on the left wall end so it is soon time to glue it to the model. I then used Tamiya primer on the Mansard and since it's such a nice gray I may leave the shingles that color. It brings out the shingles shape nicely. I'll mask the shingles and air brush the white trim. 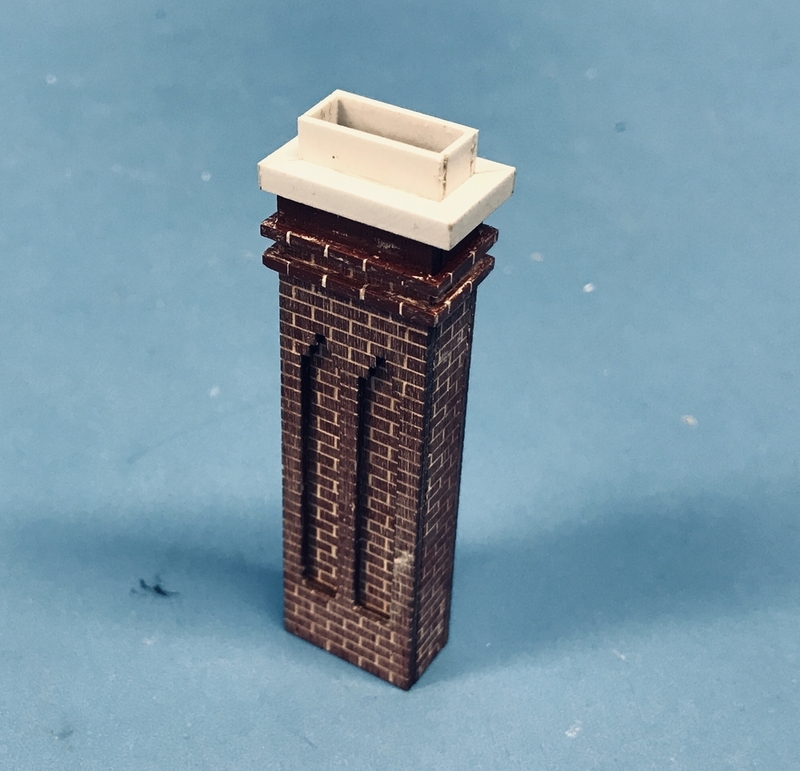 I then finished up the chimney. Instead of using the laser cut pieces for the trim bands, I used a base of 0.060" X 0.040" strip to form the band base, and then hand laid my pre-cut styrene bricks left over from making other chimneys on other projects. The bands were attached with med CA. I have full-length bricks, 2/3 bricks and half bricks. I try to lay them so the corners look correct. With the bricks in place I needed to build the masonry cap. I first was using some MDF, but quickly realized that it wasn't working, so I used 1/8" square styrene. I wanted the overhang to be similar to the brick trim row. I cut the pieces to length on the Chopper and then sanded an accurate miter and attempted to perfectly match the lengths of the opposite sides. I glued them together with the help of a V-block and angle block. I glued the opposite corners together, and when they were set up I joined the sub-assemblies together. For this picture I placed the cap on top. It was not glued yet. 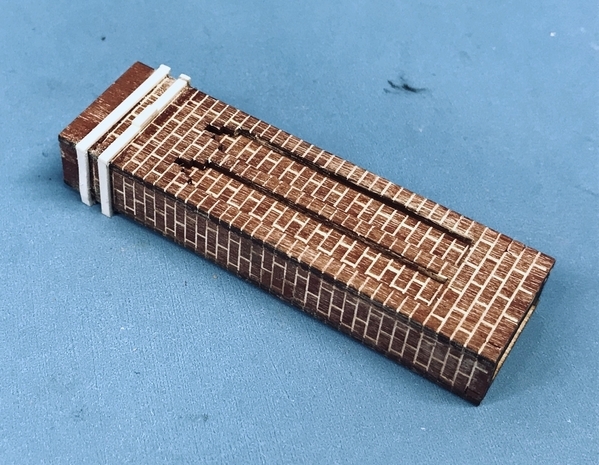 After sanding and filling any corners that needed treatment, I masked all the previously painted laser-cut bricks and then sprayed it with the Rattle Can Tamiya Red Primer. I mortared the bricks with Joint Compound and wiped it off while still wet. I glued the cap on with med CA and then carefully measured, cut and fit four pieces of styrene to act as the flue pipe. This was glued with solvent cement. I broke the shape corners with a file and cleaned up any irregularities. The last thing I did was paint the white styrene my concrete mix and then painted the insides of the flue flat black. The mansard roof and chimney look great! Friday I spent rebuilding two brass porch lamps. They were 23 years old and the candelabra sockets were completely deteriorated. We were about to buy new ones (over $400), and I thought about seeing if I could find these sockets on line. I found them for less than 3 bucks a piece. There were two per fixture so for less than $15 I bought sockets for both lamps. Replacement required complete disassembly, and while I gave it a good try, I could not really bring the brass back to life, but we'll live with it. What I did do was get two fixtures working perfectly for less than 15 dollars. But I did work on the building today, although didn't get started until 3:30. I did two things: epoxied the pins to the Widow's Walk laser cut details and masked and painted the Mansard trim. I had bought some 6 minute 2-part epoxy and that too, like the last batch I had to throw out, the resin had kicked as was almost a useless solid. So I dug out some that was at least 20 years old, but had not solidified. The pins are .021" phosphor bronze wire. When it cures tomorrow, I will airbrush them semi-gloss black. Masking the Mansard was simple to do. Air brushed it with the detail air brush Tamiya flat white. When it was dry enough to handle I pulled off the tape. I looks just the way I wanted it to. I want to paint the rain trough in front of the Mansard a darker color since I doubt that it would be bright white. Before gluing any other roof detail in, I really need to decide on and then build whatever form of exterior lighting I'm going to use. I need to do this now since I will be turning the building upside down and would damage the roof it was all installed. There's another trim panel on the front left next to the smaller door that I need to build. After this is done, it will be time to glue the Mansard down and get the gables installed. Some final roof detailing is in order. I need to create and access door to the roof area (or not). The pin epoxy trick worked! I poked the pins into some foam and airbrushed the widow's walk semi-gloss black. These are now ready to be installed when that time comes. I built the left side trim, glued it in place including the last of the 3D printed doodads and then airbrushed it in place with flat white. I had to mask the entire building face to do the airbrushing. Here's the front trim complete. Lastly, I masked and then brush-painted artist tube acrylic Mars Black for the attic space AND the waterway in the gutter system. I'm not making the same mistake by leaving bare wood in a partially visible space like I did in the turret window on Nighthawks. I also did another repair project today. Our Waterpic shower head was just getting awful with water squirting in all directions, and many holes dribbling or completely blocked. I couldn't figure out how to take it apart, so I went on Google and found a nice video on disassembling a model similar to ours. After taking it apart I found little chunks of precipitated lime clogging about 1/2 of the holes. I soaked it all in CLR and then used a small drill in a pin vise to open up all the holes. I put it back together, put it in the shower and tested it. It worked great until the front control ring blew off. I hadn't realized that in order to get it apart I had to break it away from the backing piece, which didn't remove when you took out the plastic nut that holds its all together. I took it back to the shop and mixed up some of the same epoxy I used on the pins yesterday, and it's curing nicely. I put it back in the shower and it will be okay for use tomorrow. The front trim really looks great! My wife would die if she didn't have a working shower head! It's a good thing we have two showers! I ended up with 4 or 5 lamp kits over the years at yard sales. I also still have single, two way, and three way lamp sockets and base sockets, just used my last ceramic extra in the garage last year. When the national big box home improvements drove the locals under I bought a "lifetime" worth of a lot of things for dirt cheap. At 1¢ or 2¢ I didn't buy lawn bags for a decade either, lol. I just used one lamp socket in faux fireplace logs the other day with a 15w vs a 7w candlebra (toying with tv backlighting levels...kinda funny, I don't really watch it) . This one has an extra long 3"(?) lamp control shaft topped with a dark "wood-brown", octoganal at least, vintage twist knob. I'm tempted to try to run the fast angle sized shaft out of a hole in a log's branch stub, if I can get the knob off & use a small hole I think it may hide in plain site. I have chemicals that can patina quickly, although as noted in the Nighthawks build I didn't use it for the flashing since I couldn't use it after the flashing was installed. I may use copper again on this build, but this time, I'll pre-treat the flashing. At noon I had my first physical therapy session to see if we could improve my sciatica. My son in law orthopod suggested trying PT first since he didn't think I had spinal damage. I believe he was right… he usually is. I have two more appointments next week and exercises to do to strengthen my core and limber up so very tight muscles. So I got to work at 3:00 again today. But… got some stuff done. I put on the gallery name. I had made these decals when I did the interior lettering. I had three different sizes not knowing which would fit best. I put a bit of gloss clear on the white paint first to give the decals a better surface to which to adhere. The last store front item was the goose neck light that would illuminate the sign board. Again, I made it with the Scale University white metal industrial lamp shade and a piece of 1/16" aluminum tubing. I also used the surface mount LED with 30 gauge magnet wire to power it. To hold the soldered light into the shade AND insulate it at the same time, I put in a liberal amount of Bondic UV curing material, pulled the LED into it and cured it. Then added more to surround the LED and cured it again. The results were terrific. Not only did it completely stabilize the LED, but it also pretty much glued the aluminum tube in place also. I had to just add a bit of thin CA down the joint to solidly hold the shade. I machined a little base piece to finish it off and primed the assembly after masking the LED area. Then I brush-painted the shade and base piece with semi-gloss black. I drilled a hole in the wall, which miraculously, was just above where the 1st floor ceiling was. Dumb luck. It was so close that the drill actually made a little divot in the ceiling MDF. I made that divot bigger so it would bind the wires. I used a piece of 3" shrink tubing to stabilize the magnet wire and then prepared the connection to the building's power grid. I soldered heavier gauge wire to the negative lead and shrink tubed it. I then soldered the CL2N3 LED driver chip to the positive lead since my tie in to building power was before the other driver. I insulated this also with shrink tubing. I tested it and got just what I wanted. In real life, you can read the lettering under the light. Our eyes have a significantly higher dynamic range than the iPhone's. When I tied all the wiring in to the junction block I was Concerned that it was to visible from the outside in the little door, so I popped the junction block off the side servo tape and then added some new tape and fastened to the 2nd floor and tested it all again. It worked. But, as luck would have it, where I put the junction block now completely interfered with the 2nd floor vision blocks. And this kept the assembly from seating properly. So… I moved it back to where it was originally and buttoned the building up including screwing it together. That all happened after I re-glued to people to the gallery floor. The last one, I wised up and used hot glue instead of CA. Hot glue is flexible and more forgiving. I should have used it for all the people. The front light was very bright… and that was after deliberately letting some black paint to obscure some of the LED. I put a piece of masking tape over the LED to see what it would do. It reduced the light by half, but was very yellow (the Tamiya tape's color). So it does work to attenuate the glare. I will experiment with various forms of blocks to get the color right. What I need is a strong neutral density filter. The nice thing is that the LED basically produces no heat. You couldn't do this to an incandescent bulb. I really like how even the lighting is inside the gallery. It looks like a really building's lighting. Outstanding work Myles. I really enjoy the process. Well physical therapy has helped my sciatic nerve, along with prescription and steroid injection. Tomorrow is my 19th visit to PT. I hope you get relief quickly!!! The sign and lighting really spruce up the outside!! Myles, I love the way this is turning out. Thanks fellas! And thanks for the back encouragement. I'm doing all the exercises the PT gave me to strengthen my core. But it seems to be more tender now… Like all exercises, it's not instant pudding and it takes weeks rather than days to make the difference. I ordered and received a microwavable heat pad to apply after exercises. It arrived today. Didn't post yesterday which is the reason for this Saturday post. I'm annoyed at my audience. How come you guys didn't notice that I perforated the blank walls for the upper gutter outlet ON THE WRONG FLOOR! While waiting for the glue to dry on the Mansard, I started planning for the complicated downspout system. I'm staring at the building and something didn't seem right. I then started measuring for the capture boxes (to be made out of brass) and it hits me. I have the upper scupper holes coming out of the ATTIC, not the upper roof parapet. So I mixed up some Milliput 2-part epoxy putty and plugged the errant holes, then laid out and drilled the corners of the new locations which I opened with the Dremel and a 1/16" carbide router. After some sanding and maybe additional Tamiya filler, the mistakes will be gone. As a reminder, here's my SketchUp drawing of the downspout system. This repeats on the other blank wall so no downspouts appear in the decorative areas of the building. It's obvious that the upper collector pulls water off the upper roof, carries it to the lower junction where it joins water from the collector at the edge of the Mansard trim. 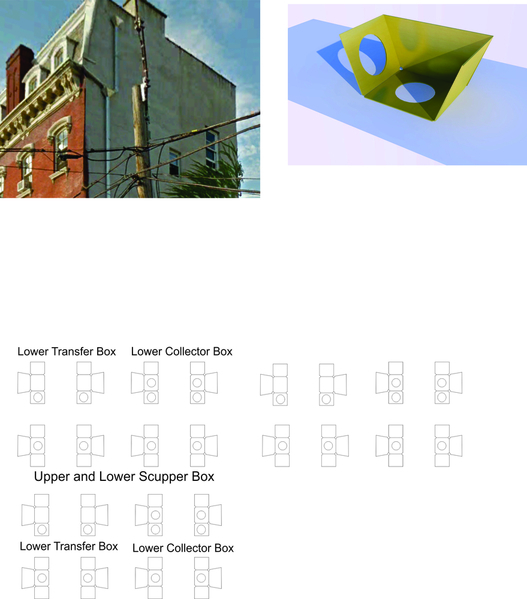 Anyway… I then tried to fabricate my first collector box out of thin sheet brass. The operative word is "tried". Here I'm drilling the inlet holes to receive the water from above and let it out the bottom. Always clamp sheet stock to a drill press table. If the drill grabs (and often does in brass), the spinning sheet would be a weapon. There was a large burr on the bottom even though I backed up the drilling with a piece of pine. I cut the shape out with small tin snips and then a nibbler. My cutting wasn't precise AND my sheet metal design really wasn't correct. You can't bend a small sheet metal box without relieving the corners. The sides did not meet well and the joint gap was really too big for successful soldering. I bent the 1/8" thick wall tubing using a spring tube bender. Thick wall forms tight radii better than thin wall, which will collapse on tight bends. The box is a) not square, and b) has huge gaps. In this case I laid out the cut lines directly on the brass. Now I'm going to design the box on CorelDraw and paste the drawing on the brass, and hopefully it will be a better pattern. While all this was going on, I was pre-treating the copper foil for the flashing with chemicals to age it. I taped the copper foil with its backing on a piece of Masonite. I should have done this when I did all that copper work on Nighthawks… live and learn. The chemicals don't work well on the copper as it is. I had to use some fine steel wool to rough up the surface so the chemicals whet it evenly. First I brushed on several coats of the blackening chemical. After it reaches the darkness I wanted, I washed it off with water, dried it and then applied the patina chemical. This too required several applications. When it was dry I sprayed it with some Dull Coat to fix the patina. If not, the blue/green powder on the surface can rub off. The last thing I did was glue the upper roof in place weighting it down down so it dried in the right location. Chimney and front gable are not glued in yet. I tested it all today and the roof and Mansards are solid, ready for further detailing. The black paint gutter makes sense when I look at it. I'm going to put some 1/4 round styrene trim at the bottom edges of all the Mansards to finish off that edge and cover any small gaps. BTW: you can see that I aged the chimney cap with some black pastel powder. I also attempted to dull down the newly painted plastic "bricks" with some white weathering powder. It helped, but could be even more. I'll be adding the upper trim band on the Mansard upper lip which serves as the water barrier for the roof edge and the mounting space for the widow's walk trim. Still mind-wrestling how I'm going to flash the gable-to-Mansard joint. BTW: I also have to add some roofing material to the curved gable roofs. Meanwhile, I'm doing final designs on the 40" engine house. This time, I'm actually spending that time to understand not only what it will look like, but how will I build it. I've already picked up a bunch of details that weren't thought through and would have caused troubles. The Military Modelers Club of Louisville (of which I'm now a member) has a new member who is the technical manager of the University of Louisville's Additive Manufacturing Research Center. It is one of the most comprehensive labs for 3D printing in the nation. We're having our next meeting at that center. AND… apparently you can rent time on their laser cutters for $4.00 an hour. If that number is correct, making the engine house just got much easier. Right now I'm paying $1.00 per minute to cut my models. That price includes the raw materials, so the price may not net out to be quite as dramatic as it seems on the face. But, I can imagine that it will be much more economical for me. 1/4" MDF is not that expensive in the quantities needed for a model. Even making the trusses for this monster is going to be challenging. Just for the raw styrene shapes it's going to cost me around $100.00, and then I have to build them. I could build the model without doing the interior work and greatly reduce the complexity and cost, but it would be nearly as cool. I've got a set of "weights" "just like that". I mean impulsive thoughts of checking my box "just like that"
Schools are a great place to find a talent for cheap. The material, electrical and a small machine fee might be all you pay for. Maybe tip the talent. Well if you want to retain them bad enough. It's been years, but I used to eat at a culinary school sometimes. Full dress tables and enough "mystery" silverware to confuse you at times (they eagerly "save you" if you ask or comment), full dress staff, a casual yet "fine dining" experience. Some folk go black tie, some go in cut offs , T, and cap. It often involved accepting whatever you get without complaint at times. Well, actually, just be nice about it, they tried.. and don't lie about the experience either. Not much is learned without critique. If something goes wrong you might be SOL though.(.. the food was ALWAYS great . Whoops!! You caught us sluffing off!! Didn’t catch that It was the wrong floor! It’s hard to get good help these days. The downspout work is coming along nicely! Planning how the engine house will go together ahead makes sense. It seems it is like putting together a puzzle. I got a quote to cut the engine house windows that's not out of line. I'm still refining the building itself and pretty much have it finalized. I posted this just a minute ago on another thread dealing specifically with Engine Houses, but I'll show it again here. I made an exploded drawing of the whole deal showing the inner and outer buttresses. The outers are just simple wood strips, but the inners have more structure to support the roof trusses and the large I-beam holding the gantry track. The inners will probably be a hodge podge of laser cut strips and conventionally cut lumber to bulk them up. 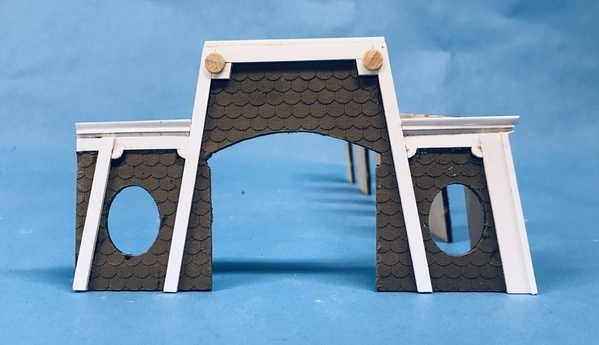 I anyone has suggestions on building those inner buttresses that won't break the bank, I'm interested. As it is it's going to be another expensive project. I've offered to do drawings for others if you'd like it in a different length and track spacing. I'm stuck with the 3.5" spacing resulting from using Ross #4 yard ladders. I didn't cut them out today, but instead got back to all the gable installation. Before I did that, I sanded the erroneous scupper hole filler and repainted the blemishes with the Antique White. Before installing, the gables needed roofing. I painted some of my very-diminished stock of the Bar Mills "tar paper" roofing some Nato black and applied it to each gable. The first window in was the front double gable and the oval windows. I used a combination of Aleen's and CA for this. I then cut and installed the 1/4 round molding to trim out the bottom edge. I then installed the four side gables. The front one fit too tightly and was distorting the bottom of the window frame. I finally removed it and shaved a smidgen off the bottom third of the opening on both sides. That corrected the problem. The rest of them went in with less trouble. The chimney was glued to the sub-roof and then tacked where the back touched that reinforcing bar that connects both side Mansard pieces together. Finally I started applying the pre-aged copper flashing and was very happy with the result. Here's a chimney closeup. I first added some step-cut copper to the chimney before installing, but it really didn't help cover the gap. So I ended up putting a wider piece that covers both sides of the joint. If you closely I've put some over the front gable. This will be repeated on all the others to cover that large gap. I still have to use the 1/4 round on the side Mansard. I could probably be done this building by the end of the week if… I didn't have two PT appts. to keep working on my lower back. So let's say that completion day will be the end of next week. Hmmm…. as I'm writing that I may be forgetting that just because the building proper is done, doesn't mean the project is. I still have to create the baseboard, the parking lot next door, the signage for said parking lot, any lighting and that wall of ivy. So let's let completion date float a bit. 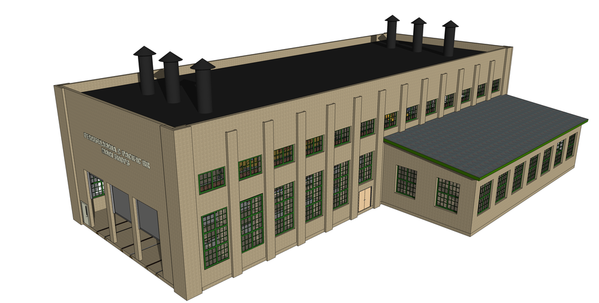 The engine house plan looks great! The house looks fantastic, Myles. That engine house looks like a nice project. Especially the detailing. Very short session today since I had PT that killed most of the afternoon. Then I went to Costco to get some berries and when I went to pull out my membership card I see that my Visa is not in my wallet, which freaked me out and killed my Costco visit. After calling my wife, she concluded it was at the Mexican restaurant we ate at on Saturday night. A phone call proved her correct. Later I picked up the card and finished my berry buying venture. But what I did get done made a significant difference. I finished the flashing, completed the top trim, fixed up some gaps on the roof, and added the remainder of the 1/4 round trim. Starting with the quarter round… I did have a small gap in the trim under the double gable which I filled with some Tamiya putty, and then did touchup painting of all the white parts that were showing some wear and tear. My flashing is not quite kosher since it's sitting on top of the shingles whereas it should be coming from underneath. I may add some individual shingles to simulate the overlap. The big arrow shows the seam that was filled. The black gutter will be touched up shortly. The pre-treated copper really works! This flashing filled those voids and makes it look like everything fits as it should. The long 1/4 round also nicely finished up the bottom joints of all those disparate components. This image shows the top trim piece installed. To this piece the widow's walk will be fastened. That will occur after the roofing material will be finished. Under the top knot (not glued in pic) I masked the glue area so the roofing will not get underneath. The roofing material will be black paint with fine gravel adhered to it. The arrows point out the top trim AND the 1/4 round. I will put the black tar paper up the parapet as it should be to prevent a leaky roof. The last thing I did was make another attempt at making the water box. This time I glued the pattern to the brass using PSA and then spent more care cutting it out and drilling the relief holes in the corners. To help prevent carbide drill breakage, I used some brass cutting oil. This prevents the drill from grabbing as it breaks through and gives more life to these delicate tools. I then used the tin snips/nibbler combo again and filed to the line. While not perfect, the results were significantly better than the first attempt and I will surely get better the more of these I do. I need four of these per system. Each box has a slightly different configuration depending on where the pipes connect. I'm getting there. Oh it is a shock to the system to realize you are missing a card or wallet! I’m glad you got it back! The flashing and trim looks great! Yes, it would be better if you could add some shingles over the flashing. It shows up on my iPhone 6s. The fill under the front window looks like my temporary repair job that turned into permanent, at least for me, on a cape cod house we owned in Virginia. I intended to replace the wood siding under the dormer windows, but figured some layers of caulking could Buy me some time. Then I got the transfer to West Virginia and we accepted the relocation company’s as is offer, and I was off the hook. It is another great building!